Sunny Southern California gardens need some shade in order for residents to enjoy them. Shade is also part of a water-wise landscape strategy because it prevents water evaporation and decreases the need for irrigation. One of the most popular ways to shield a yard from excessive sunshine is to build a pergola. 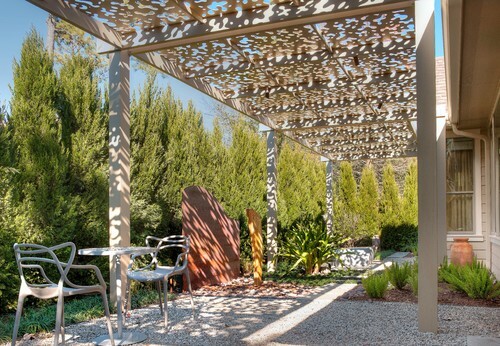 Pergolas have vertical posts that typically support sturdy beams with gaps in between them (or metal with laser cut designs) to provide shade while allowing a bit of filtered sunlight to seep through without blocking breezes. They can be attached to buildings or built as freestanding structures and are typically intended to cover walkways and patios. Materials used to build pergolas vary between wood, metal and fiberglass, however, the pillars can be made of brick, stone or pavers. 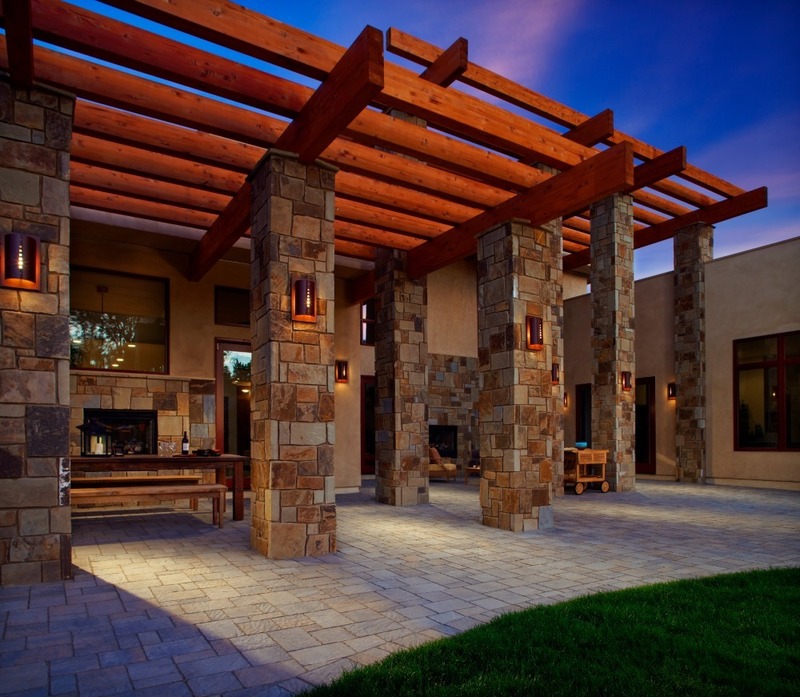 Pergolas can be designed and adapted to fit into virtually any home design. The pergola ideas below showcase how some homeowners best used them to enhance their outdoor living areas. If there is a particular area in the garden that you would like to emphasize, a pergola is a fantastic way to do it. The arch in the pergola above creates an illusion of grandeur while the foliage covering pergola blends it into the surroundings. Note that the columns on brick pedestals tie the structure into the existing hardscape. We also love the idea of attaching bench swings and a fan to the pergola as well to create an oasis in the garden. A pergola can add much-needed lighting to the area beneath it in the form of recessed lights, mount lights (pictured above) or even a chandelier since electrical wires can be hidden above or in between the beams. Also popular are strand lights that dangle between beams and around pergola posts. Those who would like to blend the structure into surrounding foliage or perhaps add a pop of color above eye level may want to train vines to crawl up and over a pergola. 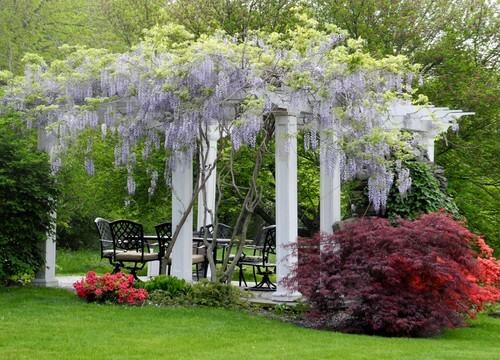 This designer chose to dress her pergola with wisteria vines that bloom a stunning purple in the late spring or early summer. Some homeowners choose vines also to create a soothing ambiance as the leaves and branches rustle in breezes. Water-wise gardeners in Southern California can also consider native vines like chaparral clematis and California honeysuckle as options for covering a pergola. Forget plain old beams and jazz up the pergola “ceiling” with shapes that will then reflect ornate shadows on to the ground. These ornate pergolas often serve as focal points and constructed out of metal that has been laser cut. 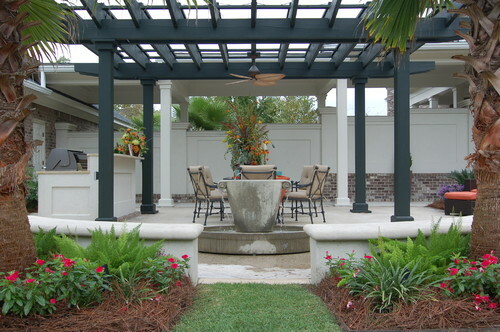 Yes, this style of pergola costs more but can dress up even the simplest of gardens. This pergola ceiling was designed in the shape of a leaf with the intention of providing a calming aesthetic over a simple water-wise garden. The pergola runs the entire length of the yard. Laser cut pergolas provide an opportunity for unique lighting as well. Apparently, the one above looks even more spectacular when light shines through the laser cuts at night. Fabric can be used in a variety of ways on a pergola. The homeowners above chose retractable fabric shades in lieu of traditional beams to protect their outdoor dining room from the sun. 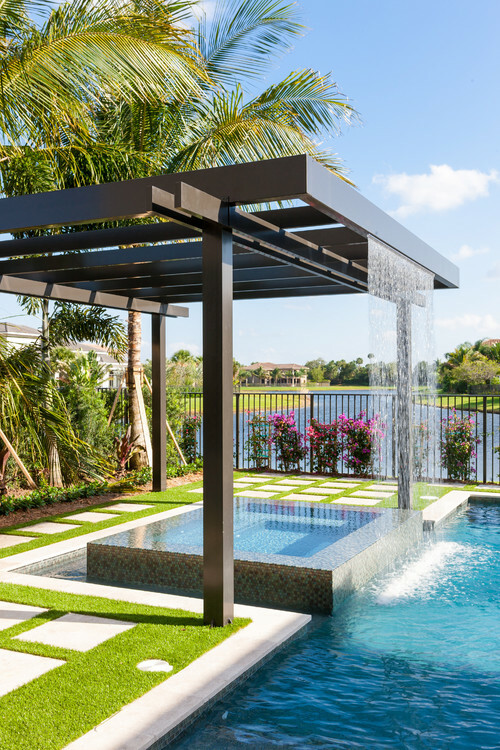 Fabric can just as easily be incorporated on the sides of a pergola reminiscent of a pool cabana, for example. Creating a fabric wall shields loungers from sun, creates privacy and also serves as a wind block. 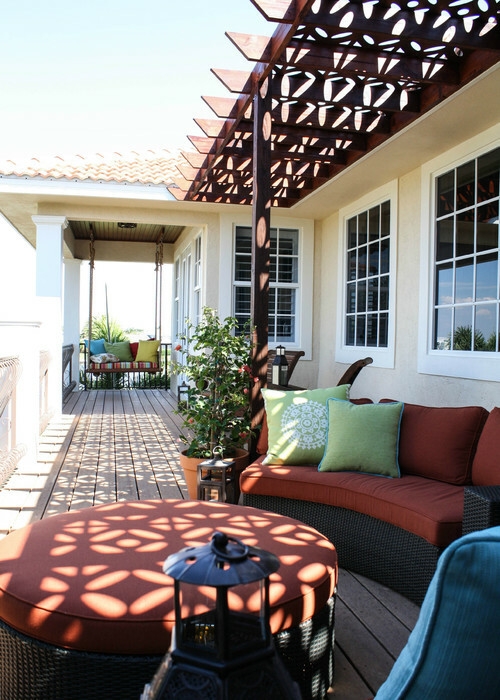 Weather and stain resistant fabrics like Sunbrella are excellent choices. We have a guide for how to care for Sunbrella fabrics since they are so commonly used on cushions, umbrellas, curtains and other outdoor accents. 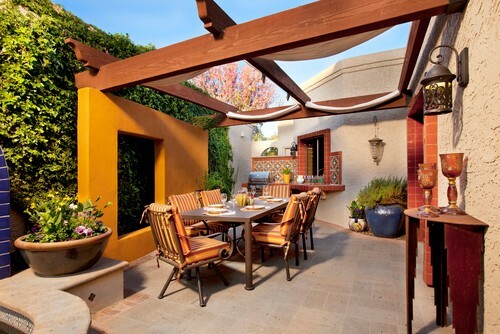 A pergola can be designed in virtually any color. Use it as an opportunity to add a new striking color (as the homeowner did above) or tie it into the home by matching accent colors found on trim, stone or nearby plants. The color you choose can also highlight the area as a focal point. Pergolas do an excellent job of shading walkways. 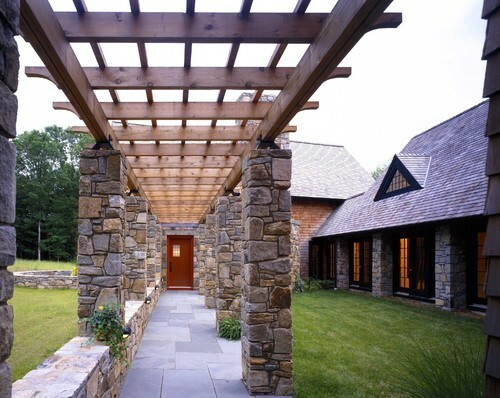 The homeowner above chose to cover a paver walkway to the front door with a gorgeous pergola using the same stone pillars that flank the home’s windows. The covered walkway also highlights the front door as a focal point and, at least the way this photo is shot, makes the space feel larger than it might be in real life. Pergolas are also often featured in side yards to cover walkways, shade seating areas and provide filtered sunlight for plants. 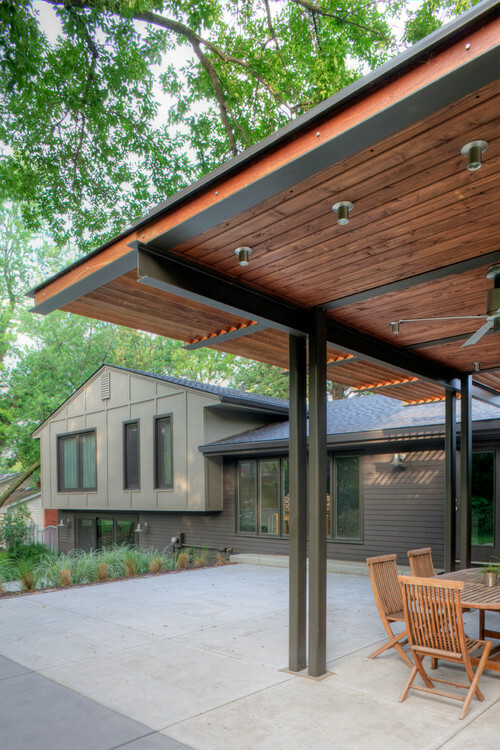 How awesome is this aluminum pergola? The water is recirculated through hidden pipes to create this stunning rain arc which certainly adds extra interest to the spa area. Beautiful ivory travertine coping and large tiles as well as artificial grass surround the pool. The design does an excellent job of tying in the nearby pond and grassy areas. Patio covers usually do not need a permit unless they are in the Coastal Zone. However, before installing a pergola check local CC&Rs, homeowner’s associations and permit requirements. Electrical outlets and hardwired lights will require permits, but will greatly improve the usability of the structure. It’s also a good idea to assess whether or not a pergola will impact a neighbor’s view. 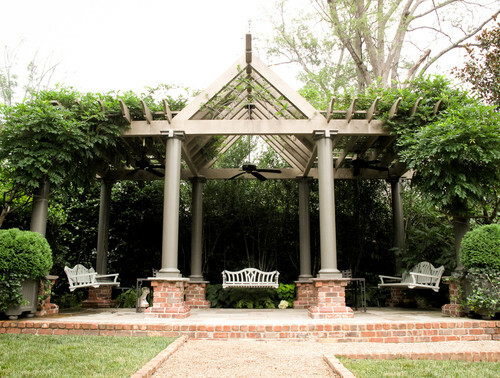 Do you have a pergola? What role does it play in your yard?